Photos of mural, painted in acrylic on the walls of Maya's bedroom. 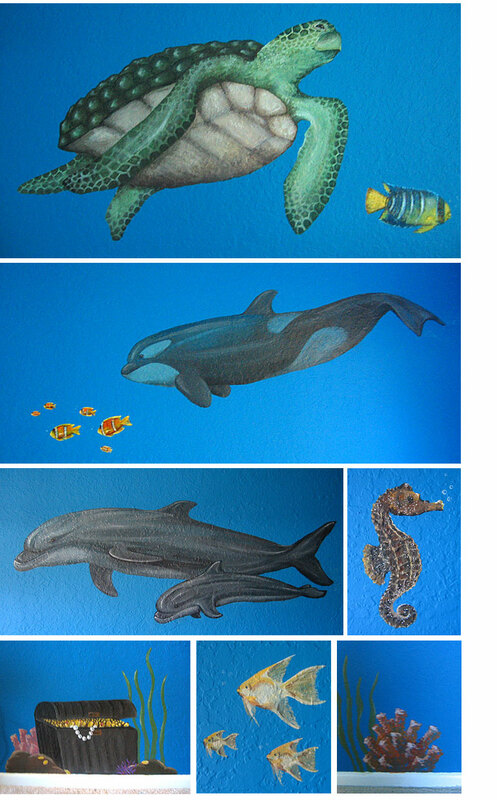 Clockwise from top left: Main wall with sea turtle and fish; Killer whale and fish; Close-up of seahorse; Coral and seaweed along baseboard; Close-up of fish; Treasure chest with coral and seaweed along baseboard. Photos of mural, painted in acrylic on the walls of the Clark family's bathroom. 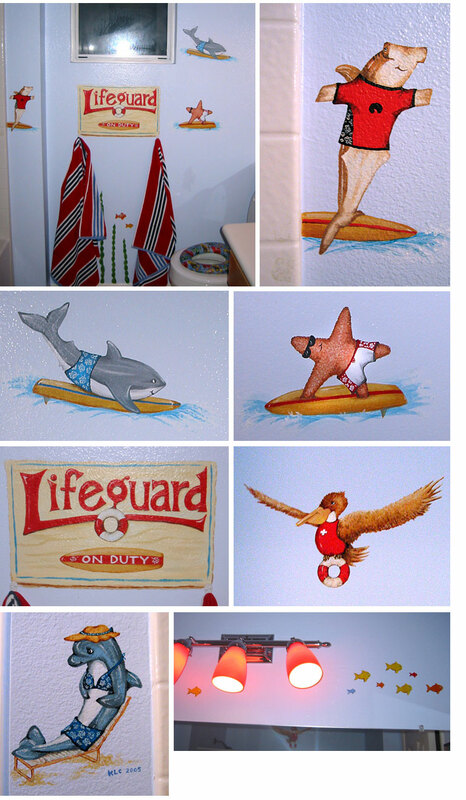 Clockwise from top left: Main wall with surfing Great White Shark, Hammerhead Shark, and Sea Star, with Lifeguard sign, seaweed, and fish; Close-up of Hammerhead Shark; Close-up of Sea Star; Lifeguard Pelican over shower; Fish around the light fixtures; Beach Dolphin; Close-up of Lifeguard sign; Close-up of Great White Shark. Photos of mural, painted in acrylic on the walls of Rebekah's bedroom. 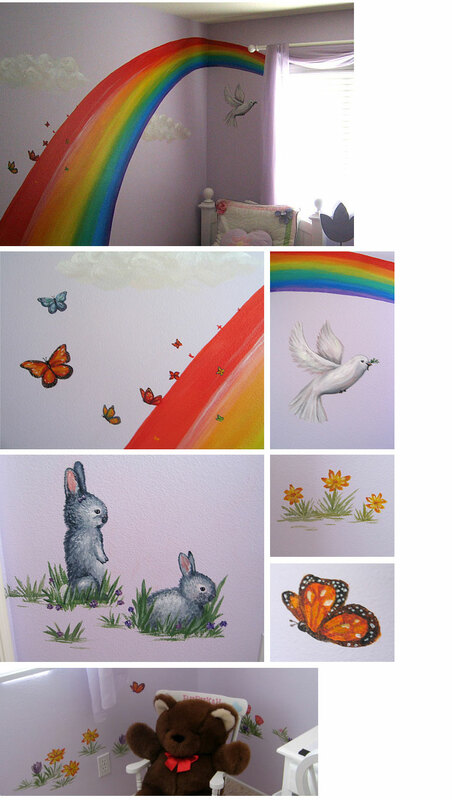 Clockwise from top left: Main wall with rainbow, clouds, butterflies, and dove; Close-up of dove; Flowers; Butterfly; Flowers and butterflies under window; Bunnies; Close-up of rainbow butterflies. Photos of mural, painted in acrylic on the walls of Benjamin's bedroom. Clockwise from top left: Main wall with planets, alien spaceship, and name graphic; Astronaut surfing on comet; Astronaut standing on moon; Planets; Space shuttle and nova; Close-up of alien spaceship. 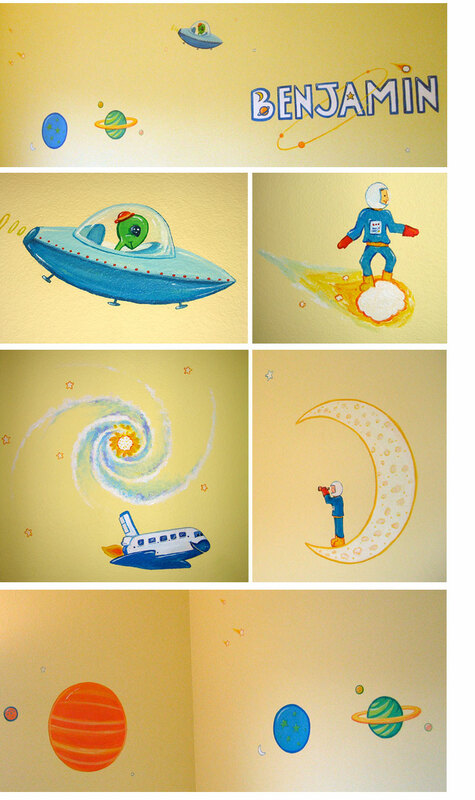 Photos of mural, painted in acrylic on the walls of Elijah's bedroom. 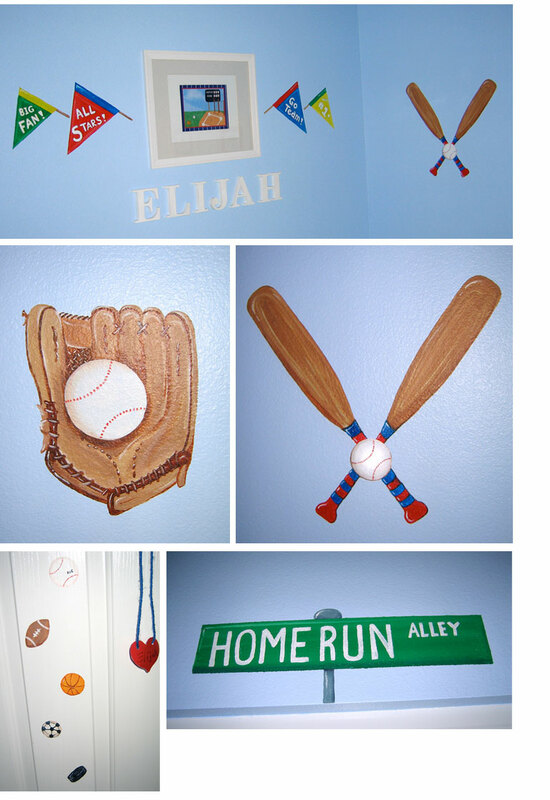 Clockwise from top left: Main walls with team flags and baseball bats with baseball; Close-up of baseball bats with baseball; Street sign above closet for "Home Run Alley;" Baseball, football, basketball, soccer ball, and hockey puck on inside of door; Catcher's mitt with baseball. Photos of mural, painted in acrylic on the walls of Dana's office. 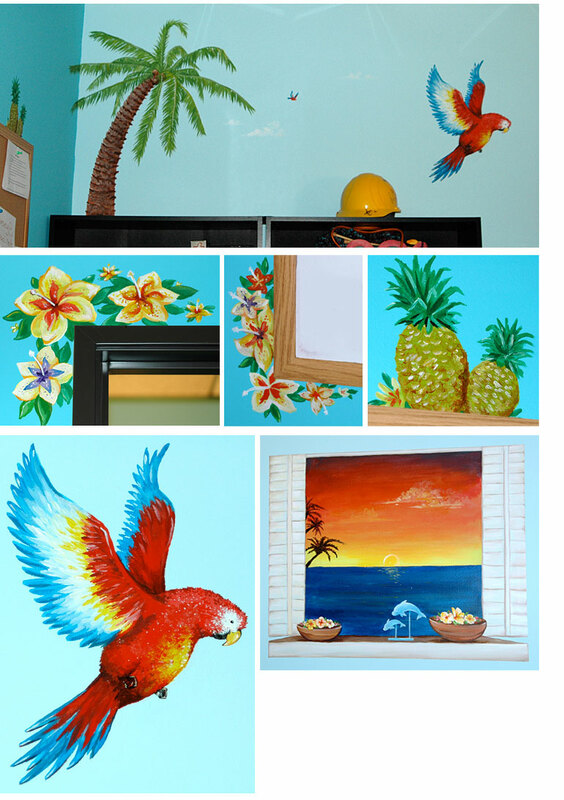 Clockwise from top left: Main walls with pineapples, palm tree, clouds, scarlet macaws; Close-up of pineapples; Window looking out on a sunset with potted flowers and a dolphin figurine on windowsill, painted on wall above computer; Close-up of scarlet macaw; Flowers over doorframe; Flowers around whiteboard.